Sugiura Yukimune worked for the Kiryu Kosho Kaisha (First Trading and Manufacturing Company), founded in 1873 by the Meiji government after the great success of the Japanese exhibit of the Vienna World Exhibition. He and his older brother Yukinari studied metalwork and carving sword-fittings in the tradition of Yokoya Somin (1670-1733). Both Yukimune and Yukinari exhibited at the Paris Exposition of 1900. The signature Koichi on this bronze is that of Yamamoto Koichi, who was responsible for the design. Typically, Koichi would produce a design to be cast in bronze, often supervised by Suzuki Chokichi (1848-1919), another master craftsman employed by the Kiryu Kosho Kaisha. 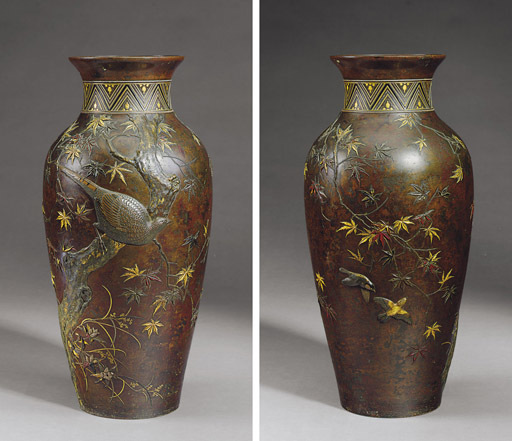 The intricate carving of the mixed-metal decoration was left to other artists like Yukimune. In this manner the Kiryu Kosho Kaisha produced many examples of bronzes that represented a successful combination of two of the principal metalworking traditions of pre-modern Japan: bronzecasting and chiselling in gold, silver and a variety of copper alloys.